Yesterday, we learned that personal income rose 0.3% during August, while the personal consumption expenditures deflator decreased less than 0.1%. On a y/y basis, the former is up 4.3%, while the latter is up 1.5%. So real incomes are growing at a solid pace. (1) While real mean income per household has been stagnating since 2000, real pre-tax compensation per payroll employee (including wages, salaries, and supplements) is up in record-high territory at $61,307 during August, which is an increase of 16.8% since the start of 2000. (2) Real wages and salaries in personal income is also in record-high territory, up 1.8% y/y and 14.6% since the start of 2000. Real average hourly earnings of production and nonsupervisory workers is up 1.1% y/y and 13.4% since the start of 2000. Over the past few years, there has been lots of buzz about the coming manufacturing renaissance in the US. The central concept is that plentiful and cheap natural gas will convince manufacturers to expand or to move production to the US to cut their energy costs. Labor is still cheaper overseas, but it isn’t as expensive as it once was in the US. Besides, the IT revolution has increased factory productivity with more automation, including robots and the “Internet of Things.” The recent strength in the dollar could be a spoiler if it continues since it reduces the global competitiveness of US exporters and provides a competitive edge for importers. (1) Capital spending. 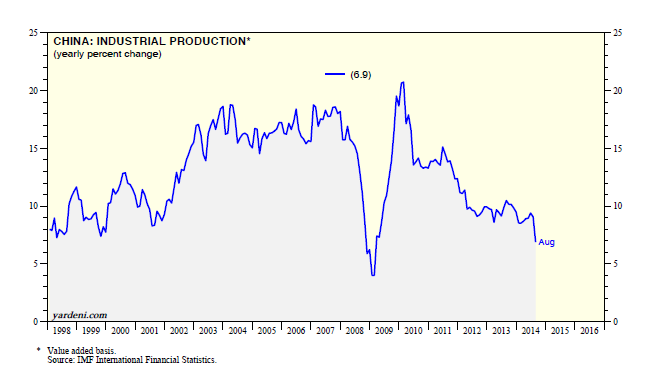 One of the strongest components of real GDP in recent quarters has been real capital spending on industrial equipment. It is up 14.7% y/y through Q2, the fastest such pace since Q4-2011. (2) Factory orders. Industrial machinery orders soared to a record high during July. They are up 37.3% y/y. Nondefense capital goods orders excluding aircraft rose to a record high during August. The latest global crude oil demand and supply data from Oil Market Intelligence (OMI) provides additional evidence of the slowdown of global growth this year. While world oil demand rose during August to a record high of 92.7mbd (using the 12-month average to smooth out the volatile monthly data), it was up just 0.8% y/y. That’s down from a recent peak of 1.7% last September, and the lowest growth since May 2012. Demand growth among the advanced economies of the OECD remained slightly negative for the fifth consecutive month. It has been mostly negative since September 2011. Among the other economies, growth was 1.9% during August, the lowest since September 2009. 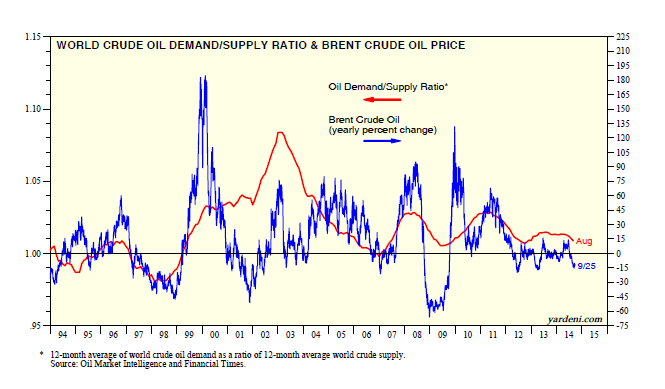 By the way, I also track the ratio of global crude oil demand to supply using the OMI data. It starts in 1994. Our ratio tends to track the y/y percent change in the price of a barrel of Brent crude oil. It has been edging lower in recent months, coinciding with the weakness in Brent. During the previous decade, there was lots of buzz about the commodity super-cycle. In my opinion, super-cycles should last at least 20 years. If so, then the latest one in commodities wasn’t so super. I reckon it lasted about 10 years, kicked off by China’s joining the World Trade Organization in December 2001 and starting to peter out when China’s industrial production growth peaked at a record 20.7% on a y/y basis during February 2010. It was down to 6.9% last month. The proponents of the super-cycle assumed that rapidly growing demand for commodities in China would outstrip supplies for a very long time, pushing prices higher. They did rise for a while. But as they say in the commodity pits, the best cure for high commodity prices is high commodity prices. High prices stimulate capacity expansion and more output, which bring prices down, especially if the long-term demand assumptions turn out to be too optimistic. The weakness in small-cap stocks this year suggests that perhaps the melt-up actually occurred last year when the S&P 600 SmallCaps soared 39.7%. The S&P 500 LargeCaps and S&P 400 MidCaps also soared 31.6% and 29.6%, respectively. So far this year, the S&P 600 has been moving sideways, underperforming the two larger-cap indexes. The bears are already growling that this is a sign of a top for the larger-cap indexes. They note that valuation multiples are stretched. With the Fed’s release of the latest Flow of Funds data last week, we now know that the ratio of the market cap of all equities traded in the US (excluding foreign issues) to nominal GDP was 1.67 at the end of Q2, the highest reading since Q3-2000. Tobin’s Q valuation measure rose to 1.12, the highest since Q4-2000. In a 9/9 interview on CNBC, Jeffrey Gundlach, CEO and CIO of Doubleline Capital, provided some very useful insights into the recent behavior of the bond market and its implications for Fed policy. 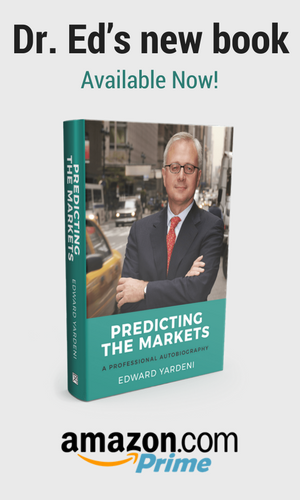 He noted that short-term interest rates have been rising, while bond yields have been falling. The yield curve has flattened since the start of the year. Through Friday, the 2-year Treasury yield rose 21bps ytd to 0.59%, while the 10-year Treasury yield has dropped 45bps to 2.59%. I also observed that in the US there is clearly less slack in the labor market and in the overall economy than a year ago. Yet both wage inflation and price inflation remain remarkably low. I noted that there are lots of reasons why this is happening and may continue to do so. Globalization continues to keep a lid on wages. Easy money has financed excess capacity around the world, which is keeping a lid on prices. There have been lots of technological innovations, which tend to be deflationary. Low price inflation is keeping a lid on wage inflation. So inflation isn’t always and everywhere a monetary phenomenon. Furthermore, deflation may be a monetary phenomenon if ultra-easy monetary policy boosts production capacity more than it does demand. According to the IMF, the world CPI down-ticked to 3.2% during July. The inflation rate for advanced economies was just 1.6% y/y. That’s the 27th consecutive month of readings under 2%. The inflation rate for emerging economies fell to 5.3%, the lowest since October 2009. Here we go again. As the Q3 earnings season approaches at the start of October, industry analysts are scrambling to lower their forecasts. They seem to do so just prior to every earnings season. It happens because companies guide analysts to lower their numbers to avoid reporting negative surprises. For some reason, analysts willingly accommodate their wishes. Their collective downward revisions rarely depress stock prices because investors have come to expect that the analysts once again are setting the stage for more positive earnings surprises. Besides, while they are lowering their numbers for the coming quarterly earnings season, they rarely do so for the following quarter until a few weeks before its earnings season begins, and so on and so forth. Since the start of Q3 during the first week of July through last week, the consensus forecast for the quarter has dropped by 4.1% to $29.12, which is below Q2’s $30.10. The latest estimate is up 5.4% from last year’s result for the same quarter. However, we can probably count on upside surprises to bust Q3’s growth. That’s what happened during Q2 when the pre-season forecast of 6.0% y/y turned out to be actually 9.9%. The weakness in the price of crude oil in the face of all the turmoil in the Middle East is extraordinary. It certainly suggests that global economic growth remains subpar. Despite a sharp drop in Libyan output recently, OPEC production continues to hover between 36mbd and 38mbd. Non-OPEC output rose to a record 54.8mbd during July. Contributing to that record high is US oil field production, which is soaring and reached almost 9.0mbd in early September. The US is now exporting 3.7mbd of crude oil and petroleum products. Preliminary data showed that retail sales stalled during June (0.2% m/m) and July (0.0). I wasn’t surprised that June and July were revised up to 0.4% and 0.3%, respectively, last week when the Commerce Department also reported a 0.6% gain in August to a new record high. Maybe last month’s gain will be revised higher too. I wasn’t surprised because the retail sales series is now even more closely in line with our rising Earned Income Proxy, which tracks the private sector’s wages and salaries in personal income. In addition, forward earnings for the S&P Consumer Discretionary Retailing Industry rose to yet another record high in early September. Furthermore, the Consumer Sentiment Index rose in mid-September, led by a 4.3-point jump in the expectations component to a 14-month high of 75.6. The present situation component eased a bit to 98.5, remaining near August’s cyclical high of 99.8. The currencies of countries that are major exporters of commodities tend to be highly correlated with the CRB raw industrials spot price index. This is especially so for the Australian and Canadian dollars. 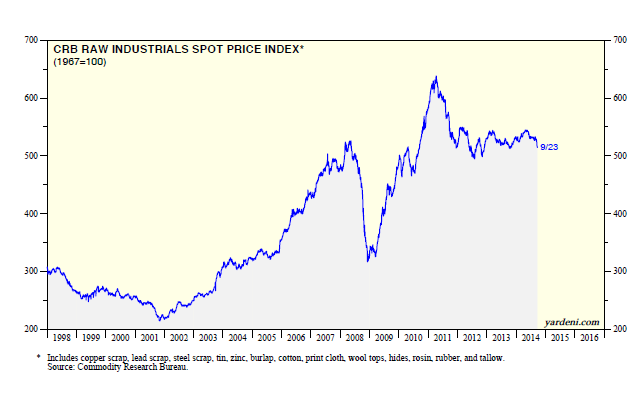 It’s not a perfect correlation, but they both do reflect the major trends in industrial commodity prices. Both currencies were especially weak last year. They regained some ground earlier this year, but seem to be rolling over again. The recent outperformance by the EM MSCI has been remarkable since many emerging markets depend on exports to the Eurozone, which has been very weak, and to China, which has been slowing. In addition, in the past, the EM MSCI (in dollars) usually declined when commodity prices were falling and the dollar was strengthening. The EM MSCI has diverged from this pattern so far this year. Perhaps a macroeconomic perspective isn’t as useful as in the past in gauging the likely performance of the EM MSCI. It may simply be that there are enough positive internal developments underway in enough of the emerging economies to drive the overall EM MSCI stock price index higher. There clearly are positive homegrown stories in India, Indonesia, Mexico, and a few other EMs that are attracting global investors. The stories tend to be about economic reforms that could spur more domestic growth. An even simpler explanation for the outperformance of the EM MSCI is that it has been and still is relatively cheap compared to the other MSCI stock composites based on their forward P/Es at the end of August: US (16.0), EMU (13.7), Japan (13.7), UK (13.6), and EM (11.3). The quality of Chinese economic data has long been questionable. Last year in May, the government launched new rules to crack down against speculative capital inflows disguised as trade payments, which boosted the exports data. I assume that the data are more accurate now. However, I am amazed that it is always available one month ahead of the other major economies. We already have August readings for China. They show that China’s merchandise trade surplus remained at July’s record high of $520 billion (saar) during August. However, the seasonally adjusted data show slight downticks in both exports and imports during August. 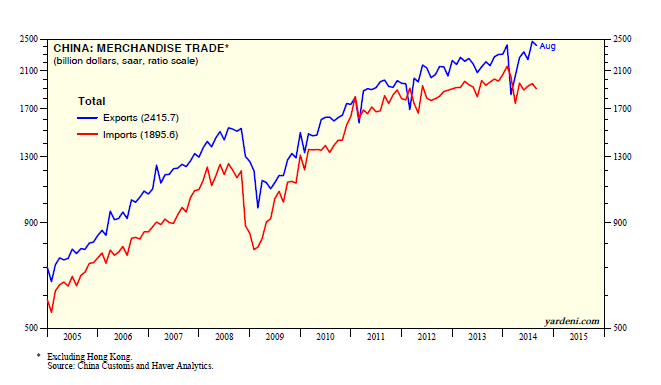 On balance, exports remain near July’s record high, suggesting global growth remains solid. On the other hand, imports seem to have stalled over the past three years, confirming that China’s domestic economy isn’t as hot and spicy as it had been in the past when imports were growing rapidly. There was widespread disappointment with August’s payroll employment gain of only 142,000. In addition, the previous two months were revised downwards by 28,000. This weakness simply doesn’t jibe with lots of other labor market indicators showing very low layoffs, plenty of job openings, and lots of national and regional business surveys with solid employment indicators. This more upbeat view of the economy was confirmed by our Earned Income Proxy (EIP), which is aggregate hours worked multiplied by average hourly earnings in the private sector. It is highly correlated with private wages and salaries in personal income. Our EIP rose 0.4% m/m to yet another new record high last month, auguring well for consumer spending. Global economic growth has slowed over the past few years. Economists such as Larry Summers are talking about secular stagnation. If this is happening, then demography may be the best explanation for it. The post-war baby boom generation is in their 50s and early 60s. People are living longer everywhere and burdening government budgets with social welfare spending on their senior citizens. The resulting budget deficits are financed with credit that is a growing liability for younger generations without creating any offsetting income-producing or productivity-enhancing assets. Demography can account for the dramatic decline in both inflation and bond yields in the US. Indeed, there has been a very close fit among the Age Wave (i.e., the percentage of the labor force that is 16-34 years old), the inflation trend, and the 10-year US Treasury yield.